We can often work out rules for ourselves by observing examples to see if there is a pattern; to see if things regularly happen in the same way. We then try applying the rule in different situations to see if it works. With inductive language learning, tasks are designed specifically to help guide the learner and assist them in discovering a rule. It can be difficult to learn a lot of new rules, but the mental effort of working out rules for ourselves, using inductive learning, helps us remember them. Also, knowing a rule doesn’t always mean that it is easy to apply in real life. When children are first shown how to ride a bicycle, it’s not possible for them to cycle unaided immediately. Parents guide and assist their children until they have gained the confidence and skills that enable them to ride on their own. It is thought that inductive learning is probably the way we learn our first language. It can be a very effective method of learning the grammar of a second language. However, one disadvantage of the inductive approach is the risk that the learner will formulate a rule incorrectly. For this reason, it is important to check that the learner has inferred the correct rule. Also, if a rule is complex it may be better to use the deductive approach and give the rule first, or give some guidance. So, which approach is best for language learning? There is no simple answer. Some learning points are more appropriate for inductive learning than others. For example, it would be very difficult to work out the rules for the use in English of the articles “the”, “a” and “an” using an inductive approach. There are so many rules and exceptions to these rules that students would need dozens of examples to cover all of the different uses. The same is true of prepositions. Often there are no clear grammar rules that apply to prepositions and their use is a question of collocation – some prepositions are commonly used in certain phrases or contexts. For example we say “ON Tuesday” not “IN Tuesday” and we say “IN May” not “ON May”. Why is this so? There is no simple rule we can give learners. In this case the best option is to learn the items as a phrase: on + day of the week and in + month of the year. On the other hand, there are some rules that are easier for learners to work out. With a few well-chosen example sentences, you could provide enough evidence for learners to discover the rule that modal verbs are followed by the infinitive without “to”. In this case, an inductive approach can work well. What’s more, with an inductive approach, learners first see the target item in context. They focus on meaning first, and then on form. 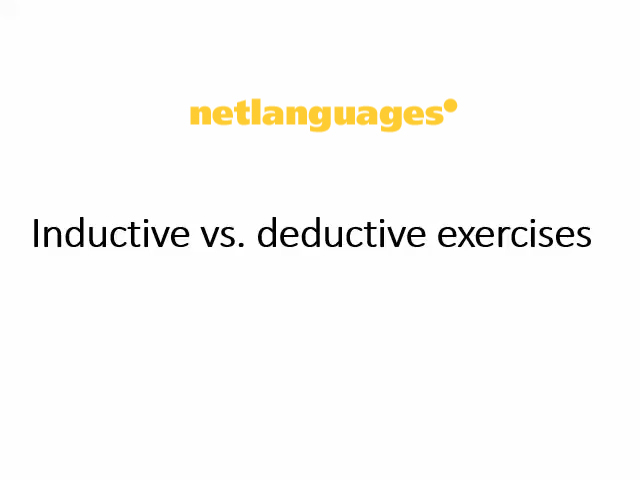 In the following video you will see examples from the General English online course of how Net Languages uses an inductive learning approach and a deductive learning approach to create exercises to learn English online.